The Braves have agreed to a deal to re-sign veteran lefty Eric O’Flaherty to a minor league deal, Chris Cotillo of SB Nation writes (Twitter links). O’Flaherty is a client of MVP Sports Group. The 31-year-old O’Flaherty struggled in 2016 in Atlanta, posting a 6.91 ERA, 6.9 K/9 and 3.5 BB/9 in 28 2/3 innings. He was one of baseball’s better lefty relievers from 2009 through 2012, then had Tommy John surgery in 2013. After a promising return in 2014, though, he has struggled with slightly diminished velocity and control issues. Perhaps promisingly, he retains a very high ground-ball rate, with a 54.0 GB% in 2016. The first three two and a half weeks of August yielded only a few minor trades, featuring pickups by the Mariners (Arquimedes Caminero and Pat Venditte), a swap of veteran infielders (Erick Aybar and Mike Aviles) and the Marlins adding some left-handed depth to their ’pen (Hunter Cervenka). Since that time, several names have changed hands, though, including Carlos Ruiz, A.J. Ellis, Dioner Navarro, Jeff Francoeur, Daniel Nava, Marc Rzepczynski and Erick Aybar. A trade sending veteran outfielder Coco Crisp to the Indians should be announced on Wednesday as well. Ryan Braun (link): Although Braun has slashed an excellent .315/.377/.551 with 24 homers and 14 steals through 454 plate appearances this season, his pricey contract enabled him to slip through waivers. Braun, 32, is owed $76MM through 2021, and any team acquiring him would likely need Milwaukee to pick up a sizable chunk of his contract, according to FOX Sports’ Ken Rosenthal. That doesn’t seem to bode well for the possibility of a trade this month. Ervin Santana (link): Santana, 33, is due $13.5MM per year through 2018, which makes him a fairly expensive investment, but he’s in the midst of another fine season. The righty has been among the few bright spots for the last-place Twins, having recorded a 3.54 ERA, 6.9 K/9 and 2.38 BB/9 in 147 1/3 innings. Given that he cleared waivers, the Twins might have to eat some of Santana’s contract if they wish to move him for a decent return. However, Minnesota reportedly needed to be “overwhelmed” to deal Santana in July, and it’s doubtful their bullish opinion of him has changed since then. Ryan Howard (link): It seems as if any possibility of a Howard trade has gone out the window with his time with the Phillies drawing to an increasingly pleasant end. But he does still deliver more pure power than most hitters — albeit almost exclusively against righties — with 19 long balls in less than half a season worth of plate appearances. Matt Wieters (link): Not only is Wieters expensive ($15.8MM salary this year), but he’s also underperforming both offensively and defensively. Thus, with fellow backstops Kurt Suzuki and Brian McCann having already cleared waivers, it’s no surprise that Wieters did, too. Regardless of his struggles, Wieters is the starting catcher for a playoff contender with no better in-house option in place, making a trade involving the impending free agent all the more unlikely. Scott Kazmir (link): Kazmir is owed $16MM in each of the next two seasons, but he has the ability to opt out of his deal after this year. Kazmir’s run prevention (4.41 ERA) has been a letdown in 132 2/3 innings this season, although he has recorded an outstanding K/9 (9.02) to go with a 3.32 BB/9 and a superb 15.2 percent infield fly rate. The positives weren’t enough for anyone to claim Kazmir, though, and it’s doubtful the injury-riddled Dodgers will move out a healthy starter in the middle of a playoff race. James Shields (link): The right-hander was previously a high-end option that every team would’ve loved to slot into its rotation. At 34, he’s now pitching like a DFA candidate. The White Sox, who acquired Shields from the Padres earlier this year, owe him $10MM per season through 2018. Thanks largely to a plummeting strikeout rate and a propensity for allowing HRs, Shields has run up a 7.62 ERA in 69 2/3 innings with Chicago. Overall, he has a 5.98 ERA in 137 frames this year. While Shields is on track for a 10th straight 30-start season, there’s no point in trading for someone who isn’t at least keeping his team in games every fifth day. Nick Markakis (link): The negatives seem to outweigh the positives with Markakis, who’s on a $10.5MM salary through 2018 and doesn’t bring the offensive value to the table that he used to. Since leaving Baltimore for Atlanta last year, the right fielder has hit .285/.360/.384 with a mere 12 HRs in 1,200-plus plate trips. The average and on-base percentage are clearly pluses. Fact is, though, a corner outfielder who has little power, doesn’t grade well defensively and isn’t all that cheap isn’t too appealing. Mitch Moreland (link): Moreland is amid his third straight 20-homer season and isn’t overly expensive ($5.7MM salary) in the last year of his contract, so it wouldn’t have been shocking had someone claimed him. Instead, the lifetime .251/.316/.481 hitter got through waivers and looks likely to remain with World Series-contending Texas for the rest of the season. Matt Kemp (link): Once an MVP-level player, the 31-year-old Kemp has fallen off thanks to defensive issues and a decline at the plate. As a roughly league-average hitter on a $21.5MM salary through 2019, he was fully expected to go unclaimed had the Braves placed him on waivers. They did, and that’s exactly what happened. Atlanta’s on the hook for $18MM per year of Kemp’s money for the duration of his contract. The Padres, his previous team, make up the difference. For any deal to happen, the Braves would likely have to eat a hefty portion of that cash. Joakim Soria (link): The 32-year-old Soria has become increasingly homer prone and displaying some concerning control issues in 2016, so it’s not surprising that no team risked claiming the remaining $19.72MM that he is owed through the completion of the 2018 season. Soria’s 92.8 mph average fastball is actually a career-high, and his strikeouts and ground-ball rate both remain sound, so perhaps he could be moved if Kansas City were to eat some of the remainder on that deal. Eric O’Flaherty (link): Once a powerhouse out of the Braves’ bullpen, O’Flaherty’s second stint with Atlanta hasn’t gone nearly as well. He’s never fully regained his form after undergoing Tommy John surgery in 2013, and his ERA in 2016 rested just shy of 7.00 when word of his clearing waivers broke. His $1.75MM salary wouldn’t be prohibitive were he pitching well, but even opposing lefties have roughed up O’Flaherty this season, and he’s been positively obliterated by right-handed opponents. Kurt Suzuki (link): The Twins’ catcher was reported to have cleared waivers just yesterday. Unlike a number of players that clear waivers in the month of August, Suzuki is relatively affordable, making it something of a surprise that no teams placed a claim on him. While he’s not regarded as a highly skilled defensive backstop, he’s hitting .281/.321/.431, which is quite a step up from the league-average catcher (.242/.311/.380). He doesn’t walk much, but he’s also very tough to strike out (12.9%), and he was owed just $1.54MM through season’s end when he reportedly cleared on Aug. 16. Brian McCann (link): It’s no surprise that McCann cleared waivers, as he’s owed a hefty $34MM beyond the 2016 campaign. McCann’s offensive production has wilted a bit in recent weeks, and while his .232/.333/.404 batting line and 15 homers are still solid marks for a catcher, it’s tough to imagine the Yankees moving him without absorbing a fair amount of the money that remains on his contract. Also standing in the way of a potential deal is the fact that teams looking for catching help beyond this year have a fair number of choices on the upcoming free agent market. One final note: outfielder Jeff Francoeur (link) and catcher Carlos Ruiz (link) were both reported to have cleared waivers as well, but each has already been traded to a new team, with Francoeur going to the Marlins and Ruiz going to the Dodgers. Royals right-hander Joakim Soria and Braves lefty Eric O’Flaherty have cleared revocable trade waivers, according to Jon Heyman of FanRag Sports. As such, either player is free to be traded to any other club. That Soria, 32, went unclaimed is hardly a surprise considering the fact that he’s just four and a half months into a substantial three-year, $25MM contract signed as a free agent this offseason. Soria, though, has hardly performed like a $25MM pitcher, pitching to a pedestrian 4.03 ERA with 9.1 K/9, 3.7 BB/9 and a 52.9 percent ground-ball rate. While the strikeouts and grounders are impressive, Soria has demonstrated the worst control of any healthy season he’s had in his career this year and is allowing hard contact at a career-high rate of 29.3 percent, per Fangraphs. The frequency with which opponents are barreling up his offerings has led to a career worst 1.4 HR/9 rate. Soria is earning $7MM this season in the first year of the slightly backloaded deal, meaning he still has $19.72MM remaining on his pact from now through the end of the 2018 season (including the buyout of a 2019 option). While his performance to date hasn’t been encouraging, the Royals may be able to find a taker if they’re willing to eat some of that contract, though they could also simply hope for a better performance in 2017. Soria is, after all, still missing bats and keeping the ball on the ground, as previously mentioned, and his 92.8 mph average heater is actually the best of his career. The 31-year-old O’Flaherty is more affordable than Soria, with a $1.75MM base salary on the minor league deal he signed this winter, but his performance has been considerably worse. His ERA to date sits at a decidedly unappealing mark of 6.91, and while his 54 percent ground-ball rate is promising, his 22-to-11 K/BB ratio (plus two hit batters and three wild pitches) is less inspiring. While some might hope that O’Flaherty could at least be relied upon as a lefty specialist, he’s allowed same-handed opponents to bat .284/.329/.439 against him. The Braves were able to find a taker for Erick Aybar, so perhaps there’s hope that he could be moved, but even Aybar had a solid three or four weeks of production under his belt prior to being flipped (in a trade that saw the Braves take some salary back in the form of Mike Aviles). O’Flaherty has surrendered six earned runs in his past six innings, issuing more walks (six) than strikeouts recorded (five) in that time. Injuries continue to be a problem for Athletics left-hander Rich Hill, who departed his start against Toronto on Sunday during the first at-bat of the game. Hill had to exit after the blister on the middle finger of his pitching hand popped, according to Susan Slusser of the San Francisco Chronicle. That blister pushed Hill’s start from Friday to Sunday. With the Aug. 1 deadline creeping up, scouts from several contenders were on hand to watch the 36-year-old trade candidate, as Slusser reported earlier Sunday. Durability is the big question with Hill, who hasn’t exceeded 100 innings in a season since 2007 and has already missed significant time this year with a groin injury. Hill has dominated while on the mound in 2016, though, with a 2.25 ERA, 10.66 K/9, 3.32 BB/9, 50 percent ground-ball rate and 14.5 percent infield fly ball mark in 76 innings. Scouts from the Nationals, Dodgers and Rangers were in attendance for the Rays’ Jake Odorizzi’s start Sunday against the Orioles, reports Bill Chastain of MLB.com (via Twitter). Odorizzi fired six innings of two-run ball and struck out seven against one walk in a 5-2 victory. The right-hander lowered his season ERA to 4.39 and improved his respective strikeout and walk rates per nine innings to 8.54 and 2.85. Interest in Odorizzi from the Rangers is no surprise, as they and the Rays are reportedly discussing him (and two of Tampa Bay’s other starters) leading up to the deadline. Matt Moore, another of the Rays’ coveted starters, drew scouts from the Dodgers, Red Sox, Rangers, Pirates and Nationals for his Saturday start, per Roger Mooney of the Tampa Bay Times. As is the case with Odorizzi, the Rangers are also engaging with the Rays about Moore, so Texas’ interest isn’t a revelation. Moore spun 7 1/3 two-run innings in a 2-1 loss and dropped his ERA to 4.33. The 27-year-old has also put up 7.58 K/9 against 2.63 BB/9 this season. Despite hitting the disabled list Saturday with an oblique injury, 25-year-old Braves closer Arodys Vizcaino isn’t out of play for the deadline, tweets FanRag Sports’ Jon Heyman. Although Vizcaino has struggled of late, his numbers this year – 3.00 ERA, 11.75 K/9, 5.5 BB/9 and 54.8 percent ground-ball rate in 36 innings – are mostly outstanding and he’s under control via arbitration eligibility through 2019. Those factors, not to mention his $897,500 salary this year, could combine to make Vizcaino rather appealing to reliever-needy teams. The Yankees are scouting the Nationals’ Triple-A affiliate in Syracuse, leading Barry Svrluga of The Washington Post to wonder (on Twitter) if a trade is in the works. The Nats are looking for bullpen help, per several reports in recent months, and Yankees lights-out relievers Aroldis Chapman and Andrew Miller have been connected to Washington as a result. The Orioles are interested in adding a left-handed reliever, writes Roch Kubatko of MASNsports.com. Kubatko lists the Braves’ Eric O’Flaherty, whom the O’s were previously interested in, and free agent Joe Beimel as possibilities outside the organization. 10:15am: The Pirates have confirmed the swap via press release. In exchange for O’Flaherty, the Bucs will receive cash considerations. 9:50am: The Braves have acquired left-hander Eric O’Flaherty from the Pirates, according to Ken Rosenthal of FOX Sports (on Twitter). O’Flaherty inked a minor league deal with the Pirates in February and, roughly six weeks later, his Pittsburgh stint is over. There is no word yet on what the Pirates will receive in return. However, Atlanta probably didn’t give up much in the deal as they satisfied their need for a southpaw in the bullpen. The deal brings O’Flaherty back to the organization where he has enjoyed his best seasons. From 2009 through 2013, the reliever posted a stellar 1.99 ERA, though it came with less impressive rates of 7.2 K/9 and 2.5 BB/9. In a limited sample size of 20 innings in 2014, the lefty posted a 2.25 ERA with 6.8 K/9 against 1.8 BB/9. Could a return to Atlanta mark a return to strong pitching for the 31-year-old? He’s hoping that will be the case after a turbulent 2015, his first full season back from Tommy John surgery. The veteran began the 2015 season with the A’s before an August trade shipped him to the Mets. In 25 games for Oakland, O’Flaherty pitched to a 5.91 ERA with 6.3 K/9 and 5.5 BB/9. Things dipped even further from there in his 8 and 2/3 innings for the Mets as he allowed 13 runs with only 6 strikeouts and 5 walks. 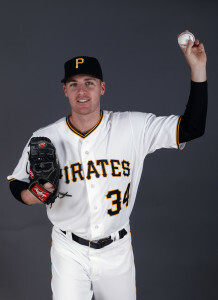 The Pirates have agreed to a minor league deal with lefty reliever Eric O’Flaherty, Tim Brown of Yahoo Sports tweets. He’ll receive an invitation to MLB camp. It has become cliche at this point, but the Bucs do have a record of helping to turn around once-productive pitchers. And O’Flaherty certainly fits the general mold of past refurbishment projects. The 31-year-old was at one time rather dominant for the Braves, running up a 1.99 ERA over nearly 250 frames from 2009 through 2013. He averaged a pedestrian 7.2 K/9 in that span, but limited the free pass (2.5 BB/9), got a ton of easy outs (58.3% groundball rate), and was plenty useful even against right-handed hitters. Things weren’t so rosy last year, his first full campaign back from Tommy John surgery. He ended with an abysmal 8.10 ERA, which only got worse after a mid-season trade from the Athletics to the Mets. And the peripherals weren’t great either, as O’Flaherty ended with 6.3 K/9 against 5.4 BB/9. He was able to generate grounders right at his career rate, and there are indications he suffered some bad luck (.388 BABIP, 57.6% strand rate), but clearly he has some work to do to get back on track in the coming spring. Free-agent left-hander Eric O’Flaherty has narrowed his list of possible teams down to four and is “should sign a deal by the weekend,” reports ESPN’s Jerry Crasnick (on Twitter). The MVP Sports client recently threw for more than 15 Major League clubs. O’Flaherty, who turned 31 on Friday, struggled through the worst season of his career in 2015, yielding 27 earned runs in 30 innings in his first full season back from 2013 Tommy John surgery. Those ugly results notwithstanding, O’Flaherty has an excellent track record as a setup man, having served as one of the Braves’ most reliable bullpen arms from 2009-13 before his injury. In that stretch, the left-hander turned in a 1.99 ERA with 7.2 K/9, 2.5 BB/9 and a 58.3 percent ground-ball rate across 249 1/3 innings. O’Flaherty was more than a lefty specialist during his Atlanta peak, as well, holding right-handers to a .247/.334/.335 batting line while stifling lefties (.188/.243/.255). While O’Flaherty’s 2015 ERA is clearly discouraging, it should also be noted that the velocity on his sinker increased over the course of the season, and his 58.3 percent ground-ball rate was an exact match with his ground-ball rate from his best years with the Braves. Clearly, O’Flaherty will have to re-establish his once-solid control if he is to recreate the success that he once enjoyed, though. The 18 walks he issued in 2015 were just three shy of the single-season high he logged in that aforementioned stretch of five years. In addition to O’Flaherty, teams seeking left-handed relief help have a number of options at this late stage in the offseason, including Neal Cotts, Franklin Morales and Matt Thornton. Scott Boras has been talking to at least six or more teams about his client Pedro Alvarez, ESPN’s Buster Olney reports (subscription required). The slugger got calls from at least five teams after he was non-tendered by the Pirates earlier this winter, though some of the clubs known to have been interested (including the Orioles, Indians and Brewers) have since moved on with other first base/DH options. Interestingly, Boras has been addressing concerns about Alvarez’s defense by making the case that Pittsburgh was positioning him too far away from the bag, which led to a larger number of errors committed in receiving the ball. Around 15 teams watched lefty Eric O’Flaherty throw for scouts earlier this week, Yahoo Sports’ Tim Brown tweets. It’s no surprise that there was interest in O’Flaherty given how impressive he was out of the Braves bullpen in his heyday, though he’s been hampered by Tommy John surgery and control issues over the last three seasons. Rafael Betancourt may only be willing to pitch in 2016 if he gets a guaranteed Major League job, SB Nation’s Chris Cotillo tweets. The 40-year-old Betancourt missed all of 2014 recovering from Tommy John surgery and posted a 6.18 ERA in 39 1/3 innings with the Rockies last year. With this in mind, a guaranteed bullpen spot will be hard to find for Betancourt despite his solid career track record. After being designated for assignment last August, Betancourt said he was at peace with the fact that he may have thrown his last MLB pitch, so it wouldn’t be surprising to see the veteran reliever officially retire within the next few months.